The Zero Gravity Thrill Park in Dallas, Texas offers five of the most extreme, adrenaline-inducing thrill rides. The one-of-a-kind park is committed to hosting only the most extreme thrill rides, and currently offers five attractions. Bungee jumping takes place from above the 7-story Air Boingo tower. The permanent platform is specifically designed for bungee jumping and is supported by a triple safety system that includes high quality bungee cords for a smooth ride, nylon safety straps, and a professional quality stunt airbag below. For those who want to take their bungee jumping to the next level, Nothing But Net is a freefall thrill in which guests drop from a 130-foot tall, 16-story tower with no bungee cord. A patented release system ensures that participants land safely onto the double netting below, which has been designed to provide an easy impact. Texas Blastoff is an extreme ride that sends guests 150 feet up in the air at rocket speeds of zero to 70 miles per hour in under 2 seconds. The four-bungee ride then takes several twists, turns and bounces as it returns to ground level. Each guest is strapped into a racing seat, and the ride is safely supported by nylon straps in addition to the bungees. Skycoaster offers thrills for up to three guests at a time. Passengers are taken in a hang-gliding harness to 110 feet above ground by way of steel cables on a crane. Guests then pull their own ripcord to release from the steel cables and swing back and forth on the bungees at speeds of up to 60 miles per hour. The Skyscraper is the park’s newest ride. The thrill ride accommodates four riders at one time, strapped into seats at the end of a 165-foot windmill propeller. As the windmill picks up speed, it passes through 60 miles per hour within the first few seconds, and eventually reaches up to four G’s of force. As the ride slows down, passengers are given some rest time at the top to enjoy the view of the Dallas skyline from 165 feet above ground. 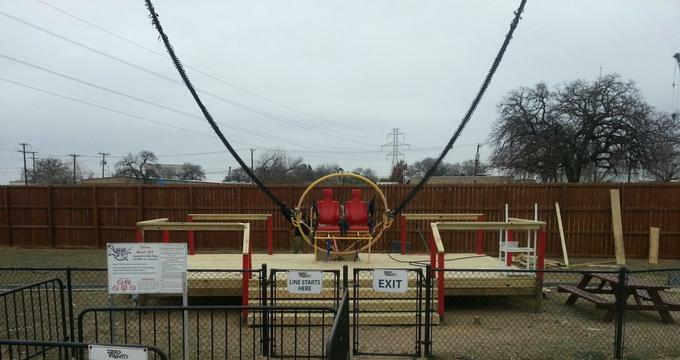 History: Zero Gravity opened in 1992 with the Dallas Bungee Tower. In 1994, they moved to their present location and have since added four additional rides. The park emphasizes their incident-free safety record, and credits a well-trained staff and each ride’s safety elements with their 26-year success in safety. Due to these strict safety regulations, not all guests are able to participate in all rides. Each ride has a height and weight limit, and some rides are not suitable for pregnant guests, guests with broken bones, or guests at high risk for cardiovascular failure. The park is owned by Amusement Management International, formed by Alan Putter in 1992. The company operates bungee jumping platforms at several Texas locations and has been the Skycoaster operator for Six Flags Over Texas since 2000. The company is the exclusive U.S. operator of the unattached ‘Nothing but Net’ free-fall experience. Zero Gravity is consistently voted among the top things to do in Dallas. Most of the rides can be done with a friend, making the small theme park a destination for adventure-seeking family and friends. Ongoing Programs and Education: Visitors to the park pay per ride, and all rides include an option to pay for a video as well. Zero Gravity Thrill Park takes videos of guest on every thrill ride. Guests may watch their videos at the park, or pay to take them home on a USB drive. The park maintains a popular YouTube site in which they upload rider videos. Combo packages include multiple rides, videos and t-shirts. Group rates are available for groups of 4 or more. Groups of 10 or more are eligible for party packages that include food and drinks, plus t-shirts and videos for all participants. The park is popular for corporate events, birthday parties, bachelor and bachelorette parties as well as high school senior days. Zero Gravity Thrill Park is open until midnight on weekends and on New Year’s Eve. What’s Nearby: Zero Gravity Thrill Park is located adjacent to Dallas’ Malibu Speed Zone. The indoor and outdoor racing-themed park offers go-kart riding for all ages, from children’s go-karts to track-based drag racing, to electric racing karts. Speedway Golf is an 18-hole racecar themed miniature golf course at the same location.